HR BioPetroleum, Inc. (HRBP), a Hawaii-based and -founded renewable biofuels company, today announced that it will acquire Shell’s shareholding in Cellana, a joint venture between Shell and HRBP. On January 31, 2011, HRBP will become the sole owner of Cellana, including its six-acre demonstration facility in Kona. conversion into biofuel. 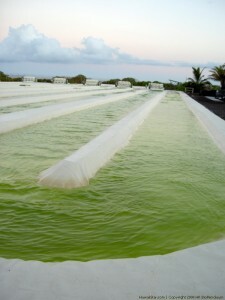 To date, it is one of the most advanced operational demonstration facilities among algae-to-biofuel organizations and companies in the United States. “The acquisition of Cellana represents a significant opportunity for HRBP and its corporate and project stakeholders, including the University of Hawaii, Hawaiian Electric Company, Maui Electric Company, the National Alliance for Advanced Biofuels and Bioproducts consortium, the U.S. Department of Energy and others,” said Ed Shonsey, HRBP CEO. as compared to other processes. Many strains of algae can grow optimally using brackish water, seawater or wastewater. aquaculture and other animal feeds, and other valuable products.